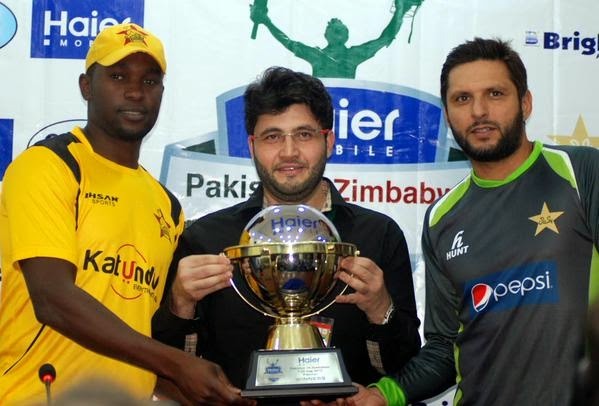 The Zimbabwe team playing on Pakistan ground has re-lived the spirit of international cricket in Pakistan. This has not only brought families to the stadium but celebrities as well. The Pak vs. Zim has become a trending topic on social media and Instagram as well. The stadium is jam packed in this hot weather of Lahore and we saw many celebrities in the ground to watch match and promote peace culture. Amid this long list of Pakistani celebs from fashion and showbiz industry, Pakistan Tehreek-I – Insaf’s chairman Imran Khan with his wife Reham also went to Qaddafi stadium for match, in high protocol. Apart from that Pakistan coach Waqar Younis believes the team was missing off spinner Saeed Ajmal as it makes a belated return to playing international fixtures at home. Khaleej Times reported, Ajmal was overlooked for the groundbreaking series of two Twenty20 games at home against Zimbabwe, having struggled last month against Bangladesh as he tried to implement a new bowling action due to official scrutiny of his previous suspect bent-arm action. It is also expected that Ajmal is also unlikely to be part of the three one-day games against Zimbabwe next week. The spectators endured several checkpoints to enter the stadium and at least 4,000 security officials were on hand. Approximately 27,000 people saw match on opening day and same number is expected today. People are happy to see the arrangements and Pakistan playing on its home ground. Here is a glimpse of the celebs’ Instagram.